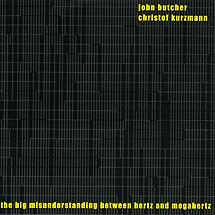 John Butcher, tenor and soprano saxophones, feedback tenor; Christof Kurzmann, lloopp and pick up. Tracks 1-5 recorded on 25/26 April 2003 at Amannstudios, Vienna; tracks 6-8 recorded on 9 September at Westwerk, Hamburg; track 9 recorded live on 8 September 2002 at Westwerk, Hamburg. Cover image (reproduced above) by Esther Stocker; graphic design by David Komary.